A pika nibbling on alpine avens. Although it looks similar to a mouse, these critters are actually more closely related to rabbits. 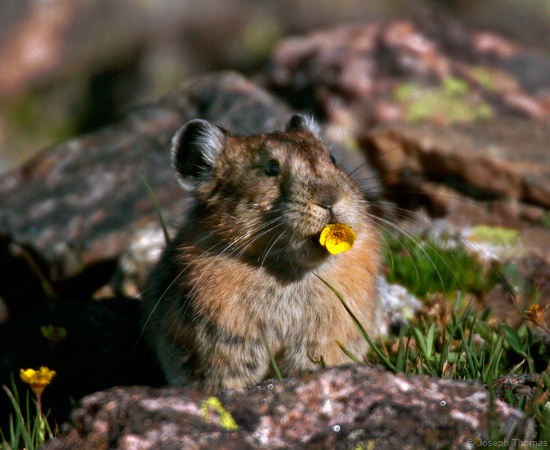 Some biologists fear the pika may be the first North American mammal to perish as a result of climate change. While global average temperatures have only risen slightly in recent decades, high alpine environments have had an average temperature increase of up to 12 degrees Fahrenheit. This temperature increase is shrinking pika habitat and altering the vegetation mix they need to survive. These high-energy animals can also overheat and die if they can't regulate their body temperature by moving into the cooler microclimate under talus (rock fields). Because they already live near the tops of mountains, when a particular talus field's microclimate becomes inhospitable, they simply have nowhere else to go.